Put the trench heater into the floor opening and if in more than one piece, join together using the bolts provided. Level the top of the trench to the finished floor level along the length of the trench run using M10 adjustable splayed feet/studs, up to 30mm adjustment is possible.. If the grille retaining angle is recessed, use the grille provided to find the finished floor level. Remove blind grommet in the base of the heater and drill through into the concrete to a depth to take a hilti red head ( or similar fixing). Fit M8 studding, washer and nut. Tighten up the nut ( adjust the feet if required ) so that the trench is firmly secured in position and at the correct level. Ensure that the feet locking nuts are tightened. Protect the trench heater from damage by others after fitting. For mounting between joists, trench heating should be ordered with joist hangers. Joist hangers are manufactured from 2 mm galvanised mild steel with a 50 mm over hang. Joist hangers can be factory fitted if dimension from finished floor level to the top of the joist hanger bracket is known. Level the top of the trench to the finished floor level along the length of the trench run using the joist hangers. Secure the trench heater in place with fixings through joist hangers. protect the trench heater from damage by others after fitting. Solder pipes together using supplied couplings. The air vent should be fitted on the return pipe exit unless factory fitted. Protect the finned element from damage by others prior to fitting the grille. Lay the grille into the trench (where there are multiple trenches, the grille will be marked with the trench reference number to which it relates). Rigid grille must be handled with care. Pick up and move using two people. The grille can be cleaned with a damp cloth. 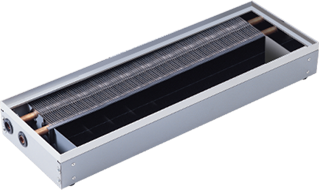 Remove the grille using the hook provided and vacuum the trench to clear any debris that has accumulated on the finned element and in the bottom of the trench heater unit. The regularity of vacuuming depends upon the environment.